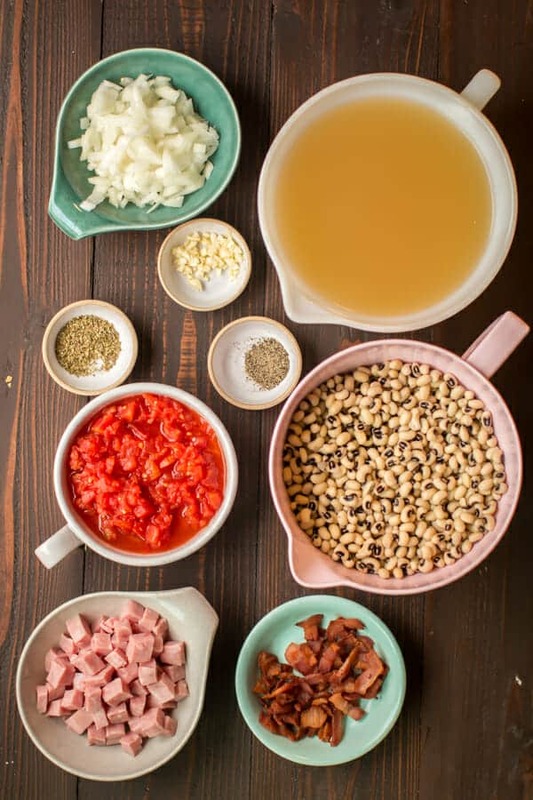 Make a new tradition with these Slow Cooker New Year’s Day Black-Eyed Peas and bring yourself good luck! The years in the past I always think to make these New Year’s Day Black-Eyed Peas too late in the day. 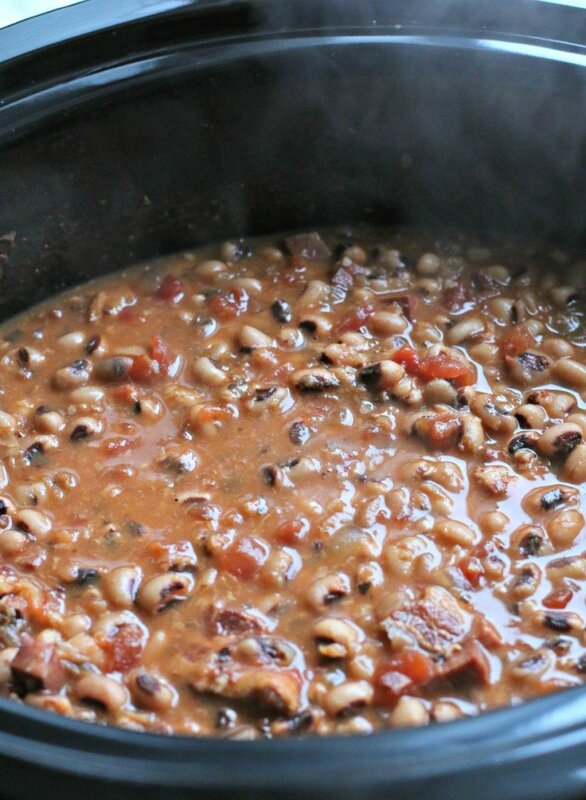 Some think that eating black-eyed peas on New Year’s Day will bring prosperity in the new year. This year I will be getting everything I need ahead of time to make these special beans. Start by soaking the beans overnight, I do this directly in a 6-quart slow cooker. I place the beans in the slow cooker and cover with water. I leave the beans to soak overnight. In the morning I will drain that water off the beans, and add the chicken broth and other ingredients. These beans need to get going early in the morning so they can get 10 hours of cooking. If you forget to soak your beans overnight, use this quick soak method. I am not a superstitious person, but I love traditions. 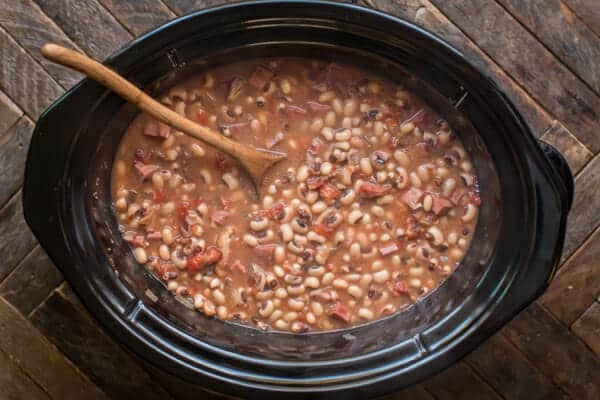 Making a big pot of these smokey beans with cornbread will be a fun way to start off my new year. Enjoy! Start by soaking the black-eyed peas overnight in the slow cooker. Do this by adding the black-eyed peas to the slow cooker and add water to cover plus a few inches more. Let the black-eyed peas soak for at least 8 hours (don't turn on the slow cooker, just let them soak). Add the chicken broth, can of diced tomatoes, bacon, ham, onion, garlic, oregano and pepper. Stir. Note- A ham hock can be used instead of the bacon and cubed ham. The grocery store I shop at is often out of ham hocks so I used bacon and ham in this recipe. If you use a ham hock, add it in the beginning, shred the meat from the ham hock at the end of cooking time and discard the fat and bone. This sounds amazing! My in-laws will be visiting for New Year’s. Dad-in-law can’t have pork, so I’ll try using some diced smoked turkey sausage. I’ll let you know how it turns out. I love blackeyed peas. Will be nice with a pan of cornbread! Make a little extra cornbread and put it in the bottom of an individual bowl .When peas are scooped over it soaking up the BEP juice, Oh dear thats good. Also serve with a peace of onon to eat with it. This recipe sounds DELISH!! But I’m cooking for some people that only eat Kosher what can I use instead of bacon and ham? Perhaps turkey bacon? And chicken thighs? That’s a tough one. Anyone else have ideas for kosher black-eyed peas? I’m going to try it with smoked turkey sausage or turkey kielbasa. I use Bakon Yeast to add a smoke flavor without adding critter to my vegetarian beans. I’ve had great results with using smoked turkey parts, ie… Turkey tails, wings or legs. 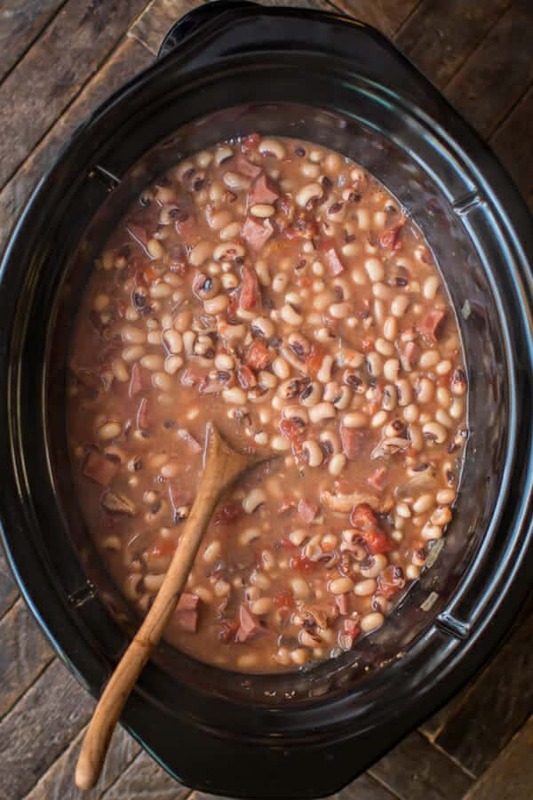 Using a slow cooker brings out the rich smoky flavor that compliments the black eyed peas. That sounds awesome Ken. Thanks for sharing that great idea. take your hambone out before the guests arrive. they’ll never know the difference and it sure won’t hurt them. you just cant make blackeyed peas without ham or bacon or saltpork. Well its rude to go to someones house and tell them how to cook…so. They’re not telling you how to cook. They’re telling you what they CAN’T EAT. I wouldn’t eat a cracker at your home. I can’t believe you suggested that!! Thats horrible!!! I totally agree that was just rude to think that you can cook black eye peas without pork in them. If you don’t eat pork well then bring your own peas or don’t eat them. Everyone wants to change things to suit them and their needs well that’s ok but don’t expect everyone to think it’s hell and damnation because others have lived on things like this for centuries and long happy lives I might add. Religious reasons, so be it but health reasons? Eating the whole pot may be bad for you but a serving won’t kill anyone. Please stop trying to change cooking for the healthy, hard working southerners who view our food as part of our culture. Rant over. I have never used meat of any kind and everyone loves mine. To each their own. 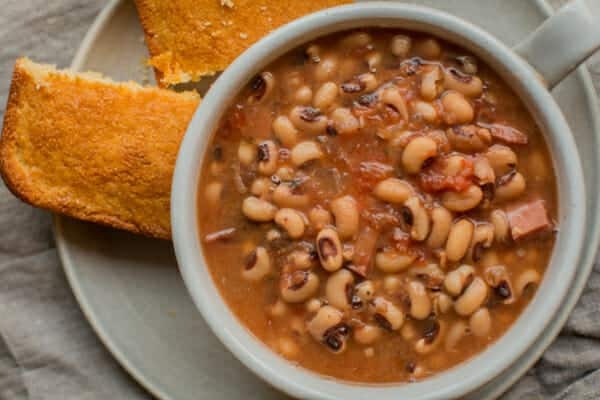 I’m with you – smokey beans and cornbread is a fabulous way to start off the new year. 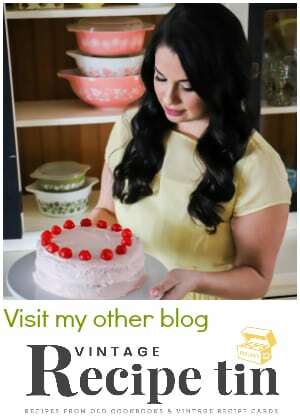 Great post – looks delicious! 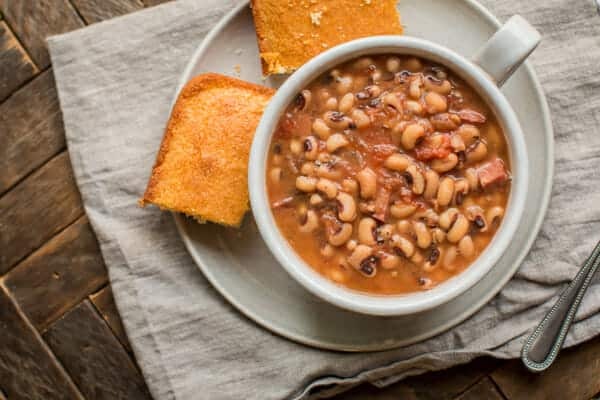 It’s been a tradition in my husband’s family to eat Black Eyed Peas on New Year’s Day and we have made the beans for our family too. 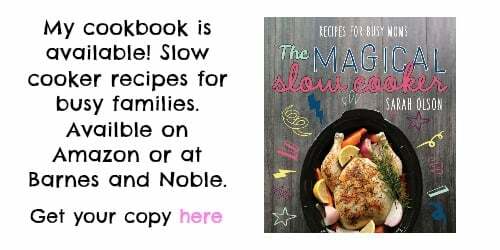 Love this slow cooker recipe! Yummy! I may just make them New Years, still can’t make up my mind. These sure do look good…. we love black eyed peas and these ones look fabulous! Great recipe for New years! 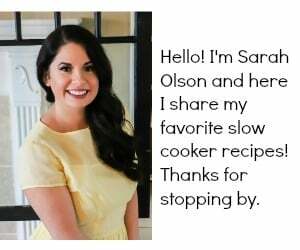 This looks like a great slow cooker meal idea, and I love that this is thought to bring good luck! I had never heard that before, and this year I am seeing it all over the web! Oh how I love black eyed peas! These look delicious! Made this for dinner tonight – absolutely delicious! I did use turkey kielbasa in place of ham or bacon and served it with cornbread. My mother-in-law doesn’t like blackeyed peas, and she went back for seconds! This is definitely a keeper. Thanks, Sarah, and happy new year! to double the recipe, would you just double everything? Yes, I think that should work well. Keep the lid on the whole time so it stays hot enough to get the beans tender. Mixed this up last night and forgot to plug in the crockpot. Right…fail. Anyway, can I do high for 5 hours instead of low for 10? I hope it works Candace. Didn’t realize it required 10 hours so I’m trying high for 5. Hope we both enjoy them tonight! It may work, I would keep the lid on the entire time. Just put it in the pot. Can’t wait to have it tonight. Instead of collard greens have a little fresh kale from the garden! Should the bean soak overnite with the cooker turned on low? no, the slow cooker is off. I soak the beans in the crock so I don’t have to dirty another bowl. I love the idea of the collard greens. I will be making this on New Years day. Can you use frozen black eyed peas for this recipe? I have already bought the frozen peas. It may work Rita, A little less liquid for sure. I’ve made this two year’s in a row and everyone rants about them. This is a great recipe! I made these for New Year’s Day. I followed the recipe exactly except I left out the bacon, since I did not have any. Best blackeyed peas I have ever tasted. I had never added tomatoes before, but the acid jazzed up the taste, plus made them very pretty. I agree Elizebeth! The tomatoes add another layer of flavor. Thanks for coming back and letting me know how they turned out for you! My husband likes to add a little jalapeno to them too! Hello Sarah from Northeastern Ontario. I made your black–eyed peas today and they were absolutely delicious. These are not usually on a Canadian menu but can promise they will be from now on. Well done you! My husband hates ham… you think just bacon and sausage will be ok? i love purple hull peas, but not black eyed peas. this recipe will be great for them, as well. You would have to do some major planning ahead for that! I do hope you try them. How would I change direction for fresh (out of garden) frozen black eyed peas? This sounds wonderful! Do you soak overnight on the counter? Or refrigerator? Counter works fine. If you decide not to make them the next day, I’d put them in the fridge. 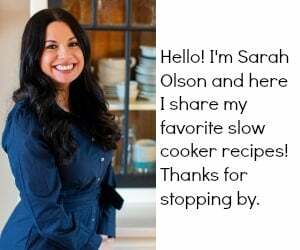 Sarah, can I cook on high for 5 hours instead of 10? I want to cook this today. Tks! You could try, usually if I cook beans on high, I do 7-8 hours. Seems like a lot, but usually what they need. I’m making this recipe and have my peas soaking right now. Is there anyway I can get the nutritional info so I can calculate weight watcher points? Or did I miss it somewhere? I tried calculating myself, but thought I’d ask if you have it handy. Very excited to try it. Sounds delicious. UPDATE.. these were very very good! A lot of flavor without adding anything else to it. I counted it as 3 WW points for 1 cup. The whole family loved it, including my daughter who has never cared for black eyed peas. I am replacing the tomatoes with a can of Rotel! I can’t wait to try them later tonight! Happy New Year! I think that will be great! The tomato part threw me off. How was the rotel? Easy recipe and delicious results. Enjoyed starting the year out with “good luck” serving this southern tradition of black-eyed peas. Hi Sarah, made these in my instant pot today. They were amazing!! that’s great Lisa. How long did they take? This recipe was awesome. I only added 3 more garlic cloves and some red pepper flakes. Definitly mash the beans about an hour before done (great suggestion!). This will be the staple for new years here on out. Thanks Sarah! We made this recipe yesterday and it was awesome! Thank you for the tasty and easy recipe! I made this last year and it was awesome! 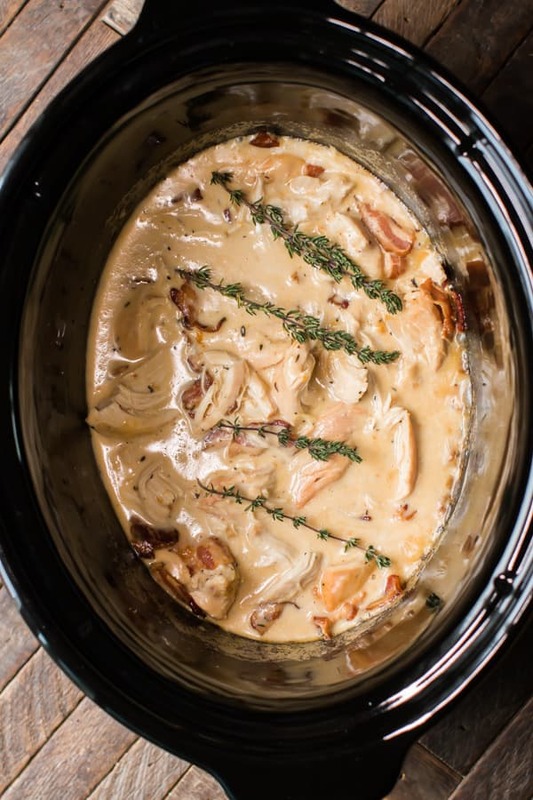 Any idea how to do this recipe in an instapot ? Hi, hannah! I’d follow the directions then cook for 35 minutes in the pressure cooker. If I were to use canned black-eyed peas instead would you cut down on the amount of chicken broth? Can I cook these on the stovetop? My slow cooker is already in use. Any changes if so? I think you may need to add more stock or water as they cook. I make this every year…so so yummy!! I got a late start making the soup. Is it okay to cook on high? If so, how long do you think? 5 hours or more? Thanks! I would do 6 hours on high. I made this and was DEE-LISH! !